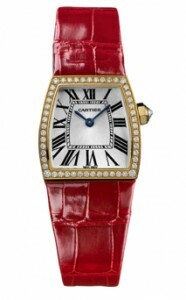 This bright red watch is how you wear your Cartier watch without subtlety! With a red leather band bearing a unique crocodile skin pattern and a 18K Yellow Gold case encrusted entirely with diamonds, the WE600451 model from the La Dona line is an expensive, luxurious watch that isn’t afraid to shout it from the rooftops. Sporting a gorgeous and subtle feature hard to include in photographs, the face of this watch is actually engraved with a silver Guilloched effect, giving the face a beautiful sun-ray detailed appearance and sheen. The case itself is an unusual square shape that tapers towards the top and widens at the bottom. The effect of this is that the Roman Numerals at the top of the watch are smaller than those at the bottom – a nice, fun touch. The case, in addition to being made entirely of solid 18K Yellow Gold, is also encrusted with 52 small diamonds, totaling .52 Carats. There is additionally, a faceted diamond on the crown – a nice touch that reminds you of your watch value every time you change the time. The band is red leather with a 18K Yellow Gold Clasp holding it all together, and the face is a scratch-resistant sapphire crystal. The blue-steeled hands are a nice contrast to the flashy exterior and accent the Black Roman Numerals well. It is only Water Resistant up to 30 Meters, but I can’t imagine one would expect to go swimming with a red Alligator band anyways. The downsides to this watch are all based in its appearance. The watch itself is made of very high quality materials, and anyone who might not like this watch would not like it upon first glance. If this watch suits your tastes, then it is a perfect fit for you. 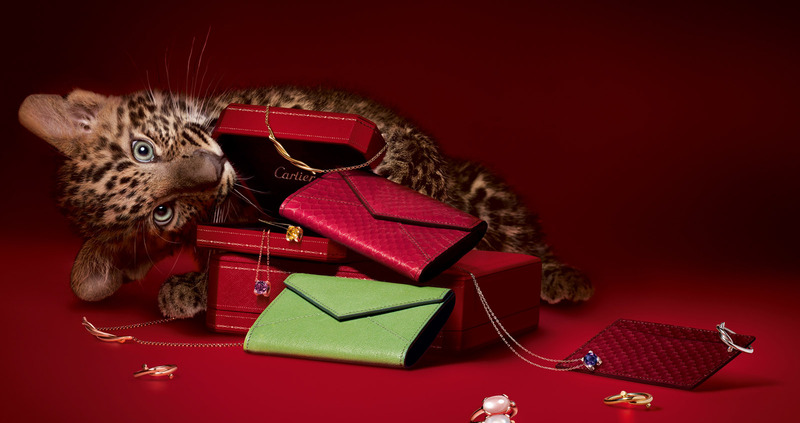 It would do well to be dressed up, as its diamond and gold materials are meant to be worn out. It is, however, a beautiful accent, and the red band and flashy face would be a fantastic bit of fun to add to an otherwise dark or color-less outfit. It runs anywhere from $14,500 to $18,000, but is hard to come by – as I only found it on two websites.